Everton and Man UTD lock horns at Wembley on Saturday with a place in the 2016 FA Cup final awaiting the winners. 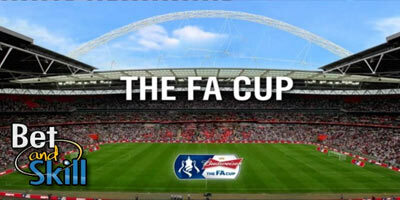 Who will win the FA Cup semifinal? Don't miss our EVERTON v MANCHESTER UTD betting preview with free predictions, betting tips, enhanced odds, starting line-ups, betting promotions and no deposit free bets on the FA Cup! Everton come into this match off the back of a humiliating 4-0 derby defeat at Anfield on Wednesday and that result leave them winless in six matches in all competitions (3 draws and 3 losses). They have scored just two goals in their last six outings and failed to find the net in their previous two encounters with the Red Devils this season. The Toffees will be desperate to see Phil Jagielka return from injury in the heart of defence as Ramiro Funes Mori will serve the first match of his three-game suspension and Seamus Coleman is out through injury. John Stones has recovered from stomach cramps and is expected to start while Gareth Barry is a major doubt. Up front, Kevin Mirallas, Aaron Lennon and Ross Barkey should continue to form the midfield offensive trio behind Romelu Lukaku. Manchester UTD are still in the mix for a top four Premier League finish after a 2-0 home win over Crystal Palace in midweek. They come into this match in buoyant mood having won five of their last six matches, including a 1-0 win over Everton at Old Trafford at the beginning of April. In fact, Van Gaal's men have beaten the Toffees home and away in the Premier League this season by an aggregate score of 4-0. United could therefore stick with the same starting lineup that saw off Palace in a comfortable manner last time out, although Marcos Rojo, Marouane Fellaini and Memphis Depay will all be pushing for starts after missing out in that one. Wayne Rooney, Marcus Rashford and Antony martial are all expected to start while Jesse Lingard and Juan Mata are battling for a starting spot on the right flank. Luke Shaw, Adnan Januzaj, Bastian Schweinsteiger and Will Keane will likely be the only absentees as the knock sustained by Chris Smalling in the closing stages on Wednesday night was not serious. Enhanced Odds! 10/1 Everton or 7/1 Man UTD to win + £100 bonus! Risk-free! Manchester UTD boost! 6/1 to beat Everton at ComeOn! Price boost! Get 10/1 Everton or 7/1 Man UTD! "Everton v Man UTD predictions, betting tips, odds and free bets (FA Cup semifinal - 23.4.2016)"